Since I didn't get a chance to play last week with Mojo Monday, I am catching up with last week's sketch as well as this morning's. I really liked both sketches, so they were easy to work with. For this week's card, I needed a new baby girl card for a friend. I decided to make this one a square card, so I cut my paper to 10 1/2 by 5 1/4 so that the finished card size is 5 1/4 x 5 1/4. 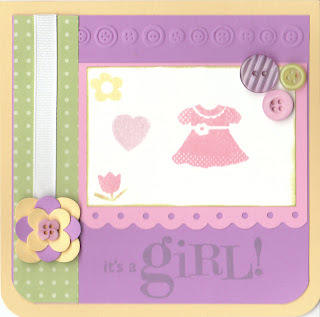 Over the weekend, I bought some new goodies from Joann's, Michael's and AC Moore, including a new Inkadinkado set called "Baby Girl." I stamped the images with Color Box chalk ink queues. They don't show up very well in the picture, though. Sorry about that! I matted the white piece onto a piece of Pretty in Pink card stock and used the Threading Waters punch on the bottom. I also got some new Cuttlebug border trim folders and that's how I got the row of embossed buttons at the top of the Orchid Opulence piece. The buttons in the corner are from a new bag of buttons that I got from AC Moore. I used Floral Fusion sizzix die with my cuttlebug for the flower at the bottom of the white ribbon and added one more button in the center. Finally, I rounded the corners and finished the card. For last week's sketch I started with a Green Galore base that was cut to 4 1/4 x11 and folded mountain style at 5 1/2. I added a piece of light blue from a Bazzill Earth tones mat pack that I had and used Soft Sky ink for the cups along the bottom. The cups and th e main image for this card came from SU's Sip by Sip set. I used Teal and some pattern SU paper for the side panel and then used my Oval Nestabilities for the center image. The lady was stamped with Charcoal Colorbox chalk ink and then I used a wet Q-tip to remove the color from her shirt, the cup, and the sentiment in the speech bubble. I used markers to recolor these images and stamped it onto the white oval piece. I added the "for your friendship" sentiment from Hero Arts "Everyday Sayings" (which is actually says "Thanks for your friendship" but I didn't use the Thanks part") with a Green Galore marker. Finally I added the ribbon and the flower in the bottom along with buttons in the top right corner and the card was done. Ok, so that's it...gotta go pick up Jonathan from pre-school. Have a fantastic day and thanks so much for stopping by! Super cute! I'm always looking for new ideas for creative baby cards. Yours is very fun. Your mojo card is absolutely adorable! Has a spring feel with the colors! such a cute mojo card, love the colors. 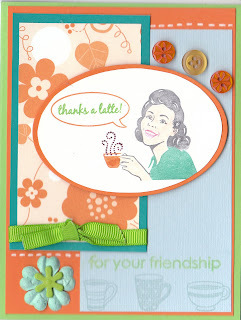 love the layout and color combo on your thanks a latte card.